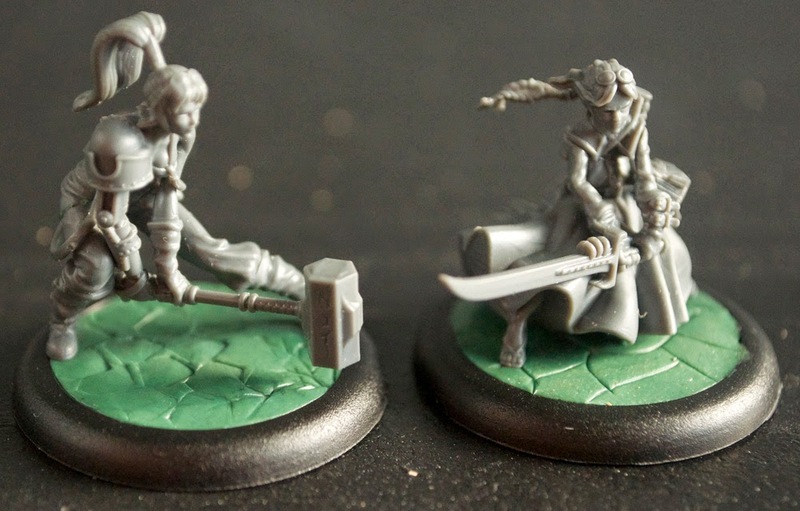 As I work at finishing up the painting for my old-version Viktoria crew, I figured I'd show some progress I've been up to in regards to the new "Hired Swords" box. 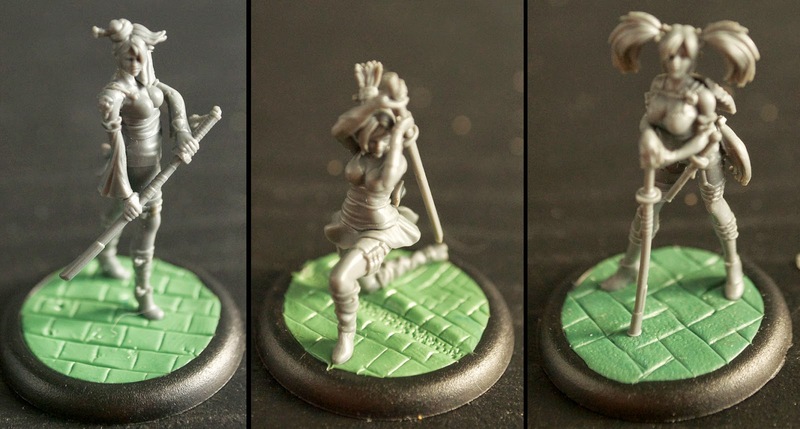 So far I've been assembling, basing, and debating converting. I don't think I'll end up using the new crew as a Viktoria crew specifically, unless I need to travel with my force, because I don't especially like the new pair as Viktorias. They're not twin enough! In the meantime, here's the rest. Taelor is on a fairly standard paving stone looking base, but with a couple nice pavement cracks right where her hammer has come down. I like the look of the new Taelor much better. The pose is interesting, and the hairpiece as far as I am concerned needs to be inverted, but otherwise, her outfit makes more sense, the hammer looks more archaic rune-axe, and the mechanical arm looks more mechanical, and less like she just forgot to put on the rest of a suit of mail. 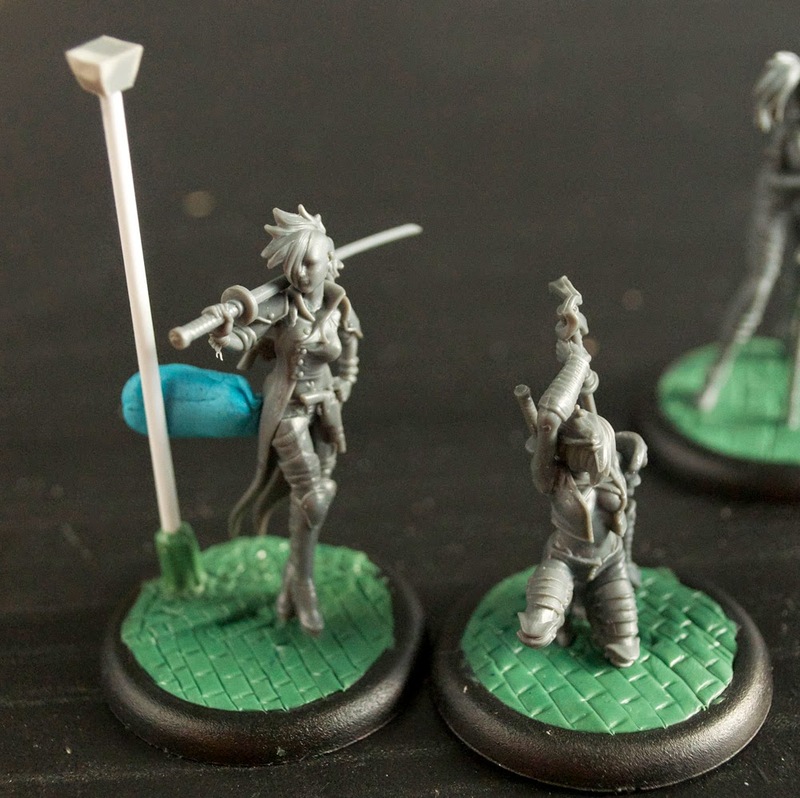 The three Ronin likewise reflect the road-feel of the crew: One straddling a gutter of some kind, the other two on relatively standard stone bases. I know some folks have had issues with the look of the new ones, but I have a theory to explain it I'll go into when I get them all painted up. The centre Ronin's base was the most complex of these to do. After putting down the putty flat, I used a length of plastic cylinder to press into the center, giving both the ditch, and a surrounding bump that helped define it. After that it was a simple matter of using a tool to etch lines, and I've just done basic stippling on the bottom. When they're painted I'll add some self-leveling gloss gel to make it look like a puddle. Finally the Viktorias themselves. Viktoria of Ashes will have a lamp stand, and I will be hopefully doing a source-light paint scheme for her, and probably for Viktoria of Blood as well. 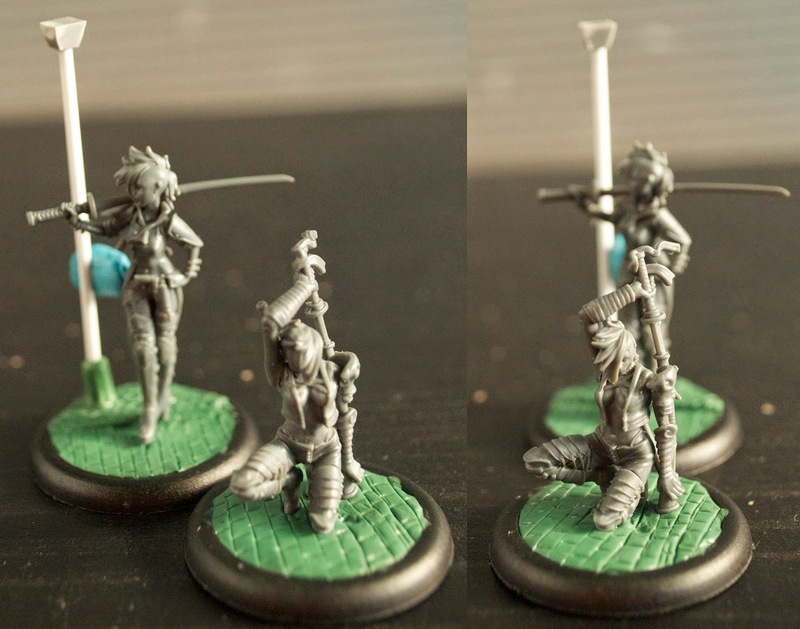 Since I already have a playable pair of Viktorias, I'll go to town making these two look all diorama-cool. With that in mind I made the paving stones line up properly, and that's fairly close to final arrangement, again if I do a full diorama setup. Viktoria of Ashes is even standing beside the curb with a drain! The light post has since been detailed more and actually looks like a Victorian style (Viktorian?) lamp post. It should be fun to paint them, but they're benched behind a few other things, so it'll take me a bit to get them done.